DR Horton stopped by the office today to update on the latest release coming for their Ho‘opili development out on the Ewa Plains. Titled ‘Akoko, it will be all multi-unit buildings with prices starting in the $300Ks on the affordable end. This is the third phase of the Ho‘opili development for DR Horton, after Ha‘akea and Hāloa, which were released earlier this year. Much like Hāloa, which sold out quickly, these units will range from 1-3 bedrooms and feature several different floorplans to fit a range of buyers. Sales will be by lottery, so let me know if you’d like to get on the list! 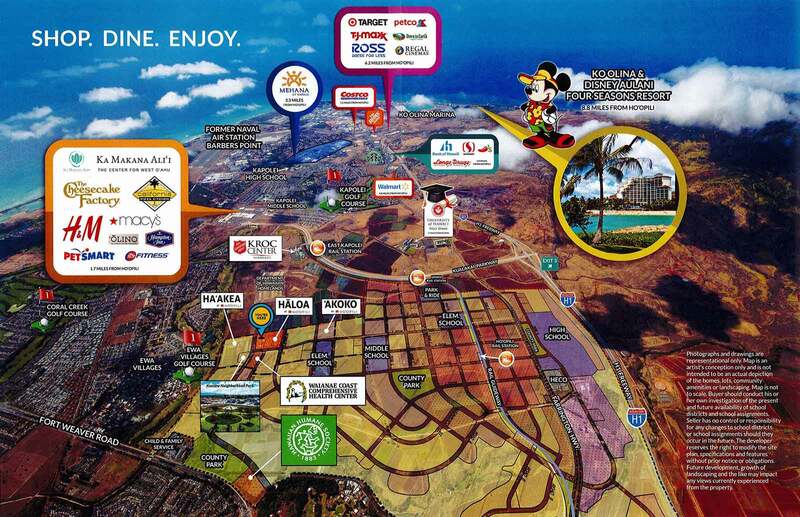 For those that haven’t heard of Ho‘opili, this is a massive housing development located south of the freeway, on the farmland between Fort Weaver Road and Kualakai Parkway in Kapolei. A fully master-planned development it will sprout four new schools, parks, commercial space, and be directly hooked up to the new rail line (see attached map provided by DR Horton). Houses will be released in small phases, and development is expected to take as much as 20 years. It’s an exciting project, not only because it adds much needed inventory to our slim housing market, but also creates a brand new, well-planned community between Ewa Beach and Kapolei.